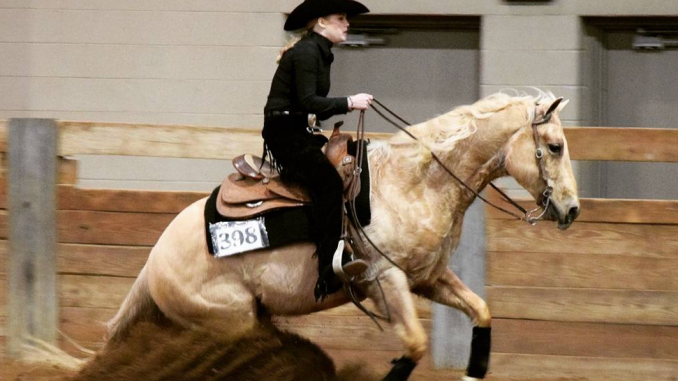 It’s safe to say that equestrian has taken Albion College senior Brooke Viele on the ride of a lifetime. In a sport that requires a great deal of travel, Viele has showed as close as Albion’s Held Equestrian Center and as far as Amarillo, Texas. This season, though, she has her sights set eastward-Harrisburg, Pennsylvania, the site of the 2018 Intercollegiate Horse Shows Association National Championships. The event encompasses the best Western and Hunt Seat riders at the American collegiate level. Her qualification process, though, is far from simple. There are two classes to Western riding: horsemanship and reining. Whereas horsemanship is more focused on the rider’s body position on the horse, reining has a larger emphasis on the horse performing precise patterns. Since Viele competes at a high division, she is eligible to compete in both of these classes. Competition is perhaps the most important component in the qualification process. What’s important to note about these points is that they carry over from season to season, making the process of qualifying successive. Essentially, every rider can eventually make regional competition. For the open class in which Brooke competes, only 28 points are required to qualify. The points reset each year, making qualifying all the more challenging. So if the regional competition hasn’t even happened yet, how has Viele already qualified for the national competition? She explained that at every weekend competition, there are high point winners, both at the team and individual level. This refers to the teams and individual riders that have scored the most collective points by the end of the weekend. Since she competes in both horsemanship and reining, she is eligible to be what is known as the high point rider of the competition. The top high point riders go on to represent their region at the national championships. When Viele travels to Harrisburg in early May, she will represent Albion College for Zone 6 Region 4. Although the entirety of the team will not be there, she is hopeful that more will qualify at the regional competition. While qualifying for nationals may be a strenuous process, it is evident that Brooke enjoys every step. After all, she has been riding since she was six. “It’s definitely been one for the books,” she said in light of her career.